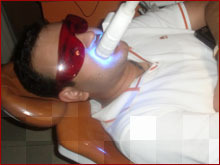 Dental bleaching, also known as tooth whitening, is a common procedure in general dentistry. According to the FDA, whitening restores natural tooth color andbleaching whitens beyond the natural color. There are many methods available, such as brushing, bleaching strips, bleaching pen, bleaching gel, and laser bleaching. Teeth whitening has become the most requested procedure in cosmetic dentistry today. Bleaching methods use carbamide peroxide which reacts with water to form hydrogen peroxide. Carbamide peroxide has about a third of the strength of hydrogen peroxide. This means that a 15% solution of carbamide peroxide is the rough equivalent of a 5% solution of hydrogen peroxide. The peroxide oxidizing agent penetrates the porosities in the rod-like crystal structure of enamel and breaks down stain deposits in the dentin.